If I clic on any cell that belongs to "Peter" row, userform must show Peter asociated picture. If I clic on any cell that belongs to "Mary" row, userform must show Mery asociated picture. Although it's not exactly what I asked for, I really appreciate your example. the transparent code you can just copy paste into the UserForm for the UserForm_Initialize bit. which should give you step 3. I tested the code from below - shorter than wellsr link you provided. also updated sample to make it easier for you. Thanks for your code, is much simpler! 2. I have to add this missing line in your macro to let userform show on selection change. 3. Do you know how to show image only (inside red square) without all that is outside red scuare? And avoid transparent effect? 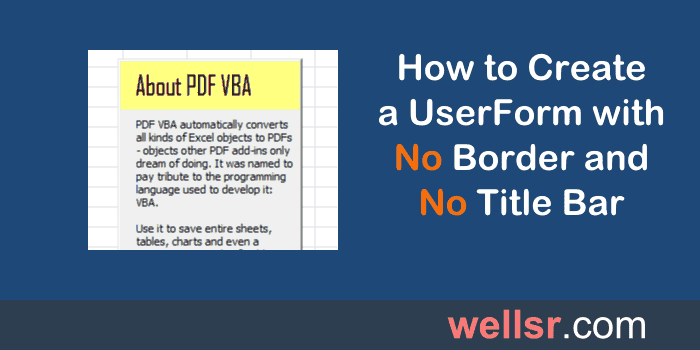 This tutorial shows you how to hide the border on your UserForm using VBA. A UserForm without a title bar and X button are far cleaner than normal UserForms. PNG isn't natively supported in userform. It requires API call. Check the sample workbook uploaded by Andy Pope in link below, see if you an adopt to your need.